Koch Pipeline owns or operates pipelines in several states, spanning about 4,000 miles, that transport crude oil, refine petroleum products, natural gas liquids, and other chemicals. 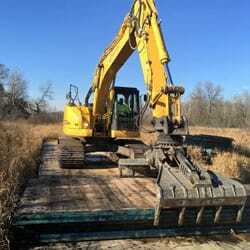 Koch Pipeline’s Wisconsin Integrity Dig project required site access within a designated wetland. 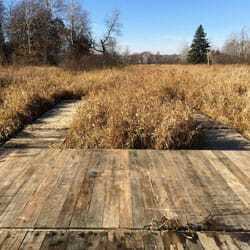 Koch called upon Sterling to design a site access solution that included building a temporary road that would safely traverse the wetland with minimal environmental impact. 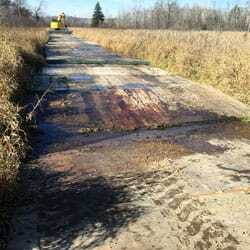 Sterling and Koch were challenged to build a temporary access road that would allow crews to perform maintenance while minimizing the environmental impact. 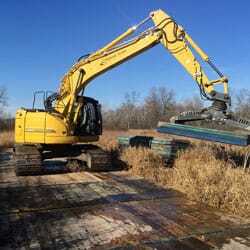 Sterling (and Midwest Access Solutions) worked closely with Koch project management to fully understand the scope, particularly the heavy equipment needed for pipeline applications. Sterling then engineered a pipeline construction solution that included a 400-mat, base mat runner system, capped with a five-ply access mat. 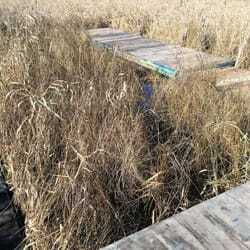 This system was the least invasive option as it reduced the total amount of square footage affecting the wetlands. Sterling used its exclusive TerraLam® 500 cross-laminated timber (CLT) mats (4’x16’) for the runner/bottom layer and then capped it with wider (8’x16’) TerraLam 500 CLT mats. 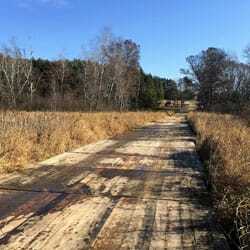 Unique to this project, installation fell in the middle of the Wisconsin deer hunting season — adding a vital safety element. Sterling assessed the additional safety risk to its team, as well as the potential for interfering with the hunting experience, and decided to stay off the site on opening day and for the rest of the hunting season. Sterling did this at no cost to Koch, choosing to ensure the safety of their site personnel and avoid interfering with the integrity of the public’s hunting grounds. 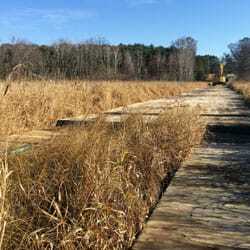 Bringing Sterling in early allowed them to create a road system with minimal impact that mitigated the ground disturbance to the wetland area. The result was evident when pumping occurred at 8-foot intervals due to the innovative design of the TerraLam product. Traditional matting would have had pumping every eight inches and required a more invasive mat system. 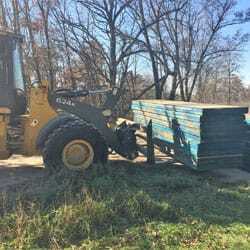 The lightweight nature of the TerraLam mats also saved Koch Pipeline tens of thousands of dollars in freight, labor, and equipment costs.